Earlier this week, NASA revealed its design for a miniature helicopter that it plans to send on a mission to Mars. At the time, the space agency said that it had conducted simulations to see whether the little chopper would be able to handle the Red Planet's icy temperatures and thin atmosphere, but it turns out the project is much further along than that – the vehicle is already built, and has been successfully tested on Earth. 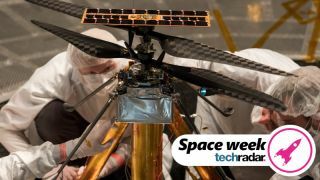 The helicopter is going through a rigorous certification process to prove it can survive the harsh conditions on the planet's surface when it arrives aboard the Mars 2020 rover in February 2021. "Gearing up for that first flight on Mars, we have logged over 75 minutes of flying time with an engineering model, which was a close approximation of our helicopter," said MiMi Aung, project manager for the Mars Helicopter at NASA's Jet Propulsion Laboratory in Pasadena, California. "But this recent test of the flight model was the real deal. This is our helicopter bound for Mars. We needed to see that it worked as advertised." The atmosphere on Mars is much less dense than Earth's, so Aung and her team used the Jet Propulsion Lab's Space Simulator to create the right conditions for the helicopter's test flights. The Space Simulator is essentially a 25-foot wide vacuum chamber. To recreate the Martian atmosphere, the team sucked out all the oxygen and nitrogen, and replaced it with carbon dioxide (the main component of Mars' atmosphere). Gravity on Mars is much weaker than on Earth, so the team attached a motorized lanyard to the top of the helicopter, which provided an uninterrupted tug equivalent to two-thirds of Earth's gravity.